While out for dinner at a local restaurant, a high ranking cop began strangling his son when the topic of marijuana sparks debate. Shawnee, OK — Police Sergeant Jesse McCord, of the Tecumseh Police Department, was arrested this week for choking his own son in the middle of a restaurant during a heated discussion about marijuana. 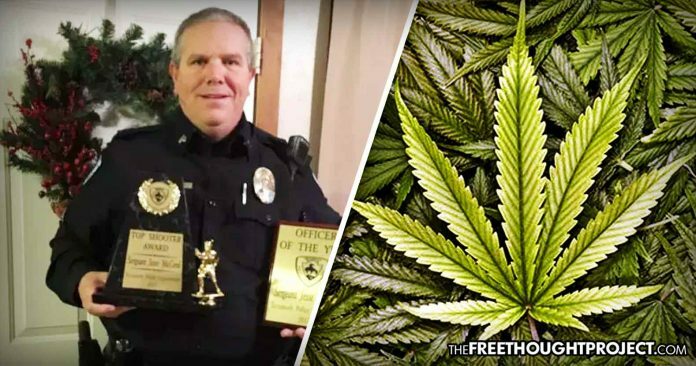 The cop who choked his own kid over a marijuana debate was officer of the year last year — which most likely included a history of locking people up for possessing marijuana. Ironically enough, the pair were out at a Buffalo Wild Wings with family and friends having dinner and drinking alcohol—a drug that McCord presumably has no issue with. However, Cpl. Vivian Lozano with the Shawnee Police Department said that conversation turned into a heated argument when the topic of marijuana came up, according to KFOR. “They were there eating dinner and having some alcohol. They were having a conversation, which ended up heated, and an argument started,” Lozano said. McCord’s son reportedly attempted to calm the situation by saying that they should leave because there were children watching, but he refused and became more belligerent. “I came with you, and you can’t make me get up…You’re f*** dead to me, you worthless piece of s***.” McCord yelled. McCord then jumped out of his chair and began allegedly strangling his son. “Strangulation is very serious. He was treated and released at the hospital. I’m not sure how injured he was or anything, but he was released,” Lozano said. McCord was arrested for assault and battery-strangulation and was placed on administrative leave. The fact that this officer was under the influence of alcohol at the time of the attack adds a terrible twist of irony to this case, considering the fact that cannabis is a far safer drug, and people who drink alcohol can be prone to violence. Of course, since alcohol is legal and cannabis is still illegal in most states, and federally, many people still carry the false belief that it is more of a danger than alcohol. Police seem especially hostile towards cannabis because many of them realize that their jobs are largely dependent on its prohibition. Meanwhile, no one has ever died from excessive cannabis ingestion, and the impairment factor is not even close to alcohol. Some studies have shown little to no driving impairment from cannabis, but of course, this depends on a person’s frequency of use. People arrested for ‘driving while high’ are convincing juries that they were not, in fact, impaired. This plant has been called a miracle drug by many and is quickly growing in popularity for its medicinal properties. Yet, despite the growing evidence of the incredible advantages of cannabis, there are powerful business and political interests that are very intent on keeping this drug illegal. Cannabis can heal or treat a variety of physical ailments, and also reduce our dependence on oil-based products and prescription pharmaceuticals. All research shows that this plant is not only harmless, but can be extremely beneficial to our environment and our society. Sadly, this case is a telling sign of how far we still have to go for mass adoption as it shows that cops are willing to choke their own children when confronted with this information.